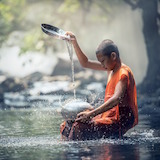 If you meditate in this manner before making a large decision—such as the decision to get married, to have children, to become a lawyer/artist/electrician, etc.—you will be more likely to make the decision that will lead you toward lasting happiness. Recognize when you need to meditate. When life becomes too complicated and you feel overwhelmed, you should meditate. Set aside sufficient time to meditate. Take an hour, or even a whole afternoon, to just stand back and reflect on what it is that will truly bring you happiness. Reflect upon what changes you need to make in your life to accomplish the things that will bring you happiness.